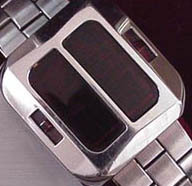 Inventor Roger Riehl began development of his SYNCHRONAR wristwatch in 1959 and claims it to be the very first LED watch. According to Riehl, there were a number of fully working SYNCHRONARs in use prior to PULSAR's prototype demo in May of 1970. Synchronar documentation - Synchronar specs, features, and complete online documentation consisting of scanned copies of the original manuals for the Mark I and the Mark IV. Also inventor Roger Riehl's original patent for the watch. Links - to other Synchronar sites. The Digital Watch Forum - a discussion area covering all types of digital watches. A short-cut to this forum is now available at the easy-to-type URL dwf.nu, where "dwf" stands for Digital Watch Forum. Photographs of my Synchronar and v-tec alpha.